In a nail-biting 4th quarter and the score tied 25 to 25, the Wildcats kick a winning field goal with 0:01 seconds left on the clock. For 59 minutes, Eastlake's defensive backs gave up short passing plays to Mount Si, but kept the talented Wildcat receivers from getting behind them for big plays. Suddenly, with just 30 seconds remaining in the game Friday night and the Wildcat's backed up inside their own 10 yard line, Mount Si's Jesiah Irish finally beat the Eastlake D and picked up 50 yards to reinvigorate the Wildcat offense. Quarterback Cale Millen drove down to the 10. With seconds on the clock, Mount Si kicked a game winning field goal and celebrated a 28-25 win in Eastlake's home opener. With the loss, the Wolves fell to 1-2 and lost an important game for playoff positioning. The field goal kick by Mt. Si. Two Wolves soooo close. . . The game was back-and-forth with Eastlake alternating big offensive plays with negative plays, particularly sacks of quarterback Connor Brown. The Wildcats meanwhile featured a balanced attack of running and passing. Millen picked at the Eastlake defense with pinpoint passing which, combined with a strong interior running game, powered the Wildcats. For the second straight week, Eastlake jumped out to an early two score lead. The Wolves got on the board midway through the first quarter when Connor Brown scrambled for a first down conversion on 4th and 3. Chris Nelson then burst 12 yards to the 9 yard line and Brown then hit Pladson with a 9 yard touchdown pass in the corner of the end zone. The touchdown was the 16th's of Pladson's career, which ties him for the Eastlake career record. 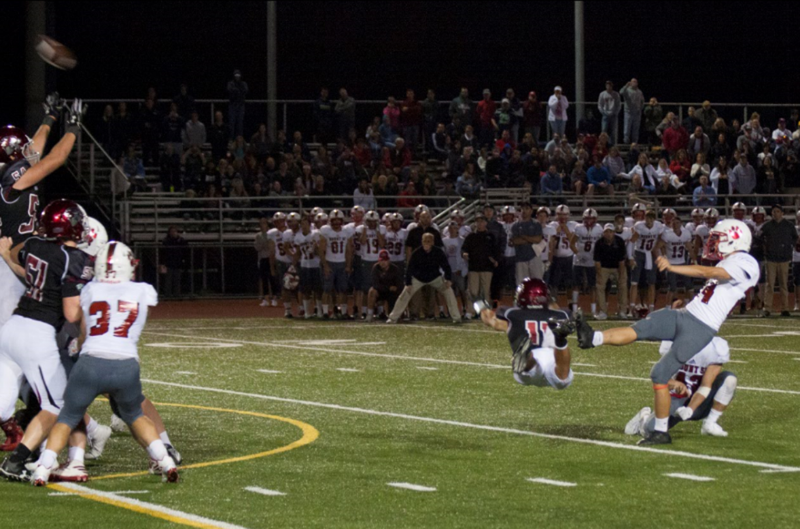 Jack Matheson continued his outstanding kicking, nailing the PAT to give Eastlake a 7-0 lead. Later in the quarter, Mount Si fumbled and Eastlake recovered on their own 44. After Brown hit Dalton Chandler with a big 24 yard completion, he was sacked on the next play, moving the ball back to the 29 yard line. Eastlake couldn't score the touchdown but Matheson hit a 28 yard field-goal to put the Wolves up 10-0 as the first quarter wound down. When Nate Sutter intercepted Millen on the Wildcats next drive, it looked like Eastlake might run away with the game but 2 negative plays forced an Eastlake punt which Mount Si returned to the Eastlake 26. From there, the Wildcats scored the next 17 points. First, Millen scrambled for a 6 yard TD. Then, after a Sam Milton tackle stuffed Mount Si's next drive, the Wildcats kicked a field goal to tie the score 10-10. Eastlake's next possession resulted in a Brown interception in Eastlake territory leading to a short field and another Mount Si score to increase their lead to 17-10. As the half ran out, the Wildcats were dominating the line of scrimmage on both sides of the ball. The Wolves couldn't get their running game going or protect Brown on offense and generated no pass rush on Millen with their defensive front. In the 2nd half, Mount Si continued marching, moving into field goal range on their first drive but missing the field goal try. The teams battled back and forth and with 3 minutes left in the 3rd quarter, the Eastlake defensive line finally stepped up. William Woodgate sacked Millen on a 3rd down play, forcing Mount Si to punt from deep in their own territory. The long snapper sailed it out of the end zone for a safety, cutting the Wildcats lead to 17-12. On the ensuring free kick, Dalton Chandler made another big play, returning the kick to the Mount Si 43. On 4th and 7, Brown feinted a rugby-style punt put pulled up and hit Jaxen Williams for a 31 yard gain and a first down on the 9 yard line. Running back Garret Carney was stopped short of the goal on 3rd down. But going yet again on 4th down, Brown hit Nelson out of the backfield for the touchdown, putting Eastlake back on top. The Wolves went back to Nelson on the 2-point PAT try but he was tackled short of the goal and Eastlake's narrow lead stayed 18-17. With 9 minutes remaining the game, the Wolves had held Mount Si and had the ball back near midfield. After a 12 yard Carney run, Brown mis-handled a snap and the Wildcats jumped on the fumble. Linebacker Jack Henderson made a big play early in the drive but Millen converted a 3rd and 23 for a first down. The Wildcats ran 7 yards for the touchdown and converted the 2 point PAT try to take a 25-18 lead. The Wolves responded once again. After a nice kick return by Nate Sutter, set up by a good block by Chandler gave the Wolves solid field position, Brown hit Pladson for a ten yard gain. On the next play, a busted coverage for Mount Si and good scramble by Brown got Chandler loose down the field. This Chandler 59-yard touchdown catch-and-run got the Wolves back in the game. Out of a nice hold by Carney, Matheson nailed another PAT, tying the game 25-25 with 5 minutes to go. On Mount Si's next possession, another Milton tackle set up 4th and 5 and forced a Mount Si punt. Two plays by Nelson (running and receiving) put the Wolves near mid-field. But another sack of Brown killed the drive and forced Brown to punt, which rolled to the Mount Si 5 yard line with a minute left in the game. After the Wildcats ran for a couple yards on first down, it looked like they would be content to run out the clock. But on the next play, they took their shot. Irish got behind the defense, the Wildcats took advantage, driving for the winning field goal. Statistically, Mount Si dominated the game, generating 400 yards of total offense to just 225 for the Wolves. However, The Wildcats committed 14 penalties which kept Eastlake in the game. Defensively, Sam Milton, Jaxen Williams, Hank Pladson and Jack Henderson led the way. Offensively, Chandler's 2 catches for 83 yards paced the Wolves. The Eastlake running game was uncharacteristically quiet as Carney led the team with 26 yards rushing. Brown threw 3 touchdowns on 179 yards passing. Eastlake's next game is Friday, September 22nd at home vs. Newport in a "must win" contest for the Wolves playoff chances.